ISTANBUL, Turkey (July 27) - The second installment of Jordan BURROUGHS (USA) and Frank CHAZMIO (ITA) is scheduled for tomorrow’s 74kg Yasar Dogu finals after both wrestlers finished the opening day with three solid performances apiece. This time around, expect the conditions to be a little more conducive to wrestling, as they will compete indoors at the Bağcılar Olympic Sport Hall on a dry mat. The two superstars who combine for ten world and Olympic medals met outdoors in May’s highly anticipated Beat the Streets finale, now known as “Slip Gate,” due to lack of footing which stemmed from the condensation build up on the mat. In that Beat the Streets match-up, Burroughs “slipped” past Chamizo and scored the 6-5 come-from-behind victory. Chamizo, the two-time world champion, and Rio Olympic bronze medalist commanded the 4-0 lead after a pair of first-period takedowns from a slide-by and a counter-offensive high-crotch. But, with short time remaining in the opening period, Burroughs, the London Olympic champion picked up his first two points and closed the Italian wrestlers lead to 4-2. The second period belonged to America's four-time world champion, as he capped off the match by blasting through Chamizo with his patented double leg, ultimately winning the bout, 6-5. 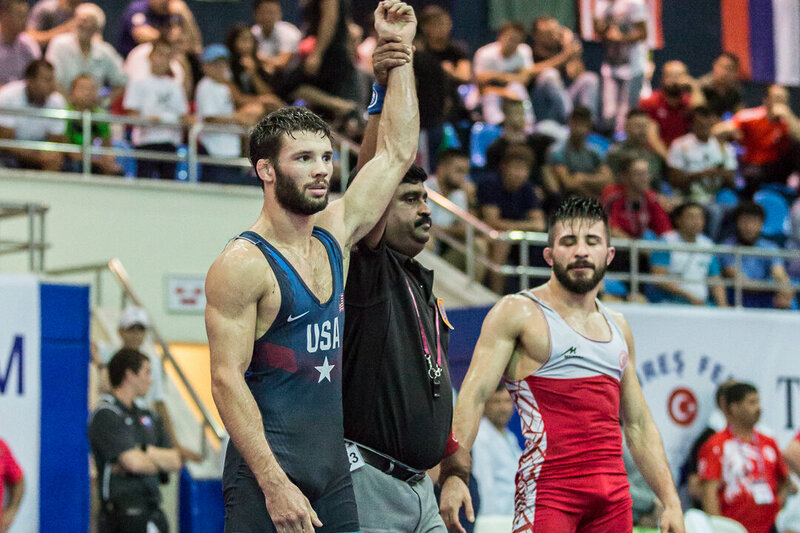 In addition to Burroughs, fellow American's Thomas GILMAN (USA) and David Morris TAYLOR (USA) made the finals in their respective weight classes. Meanwhile, Aslanbek ALBOROV (AZE), the 2017 world bronze medalist went 3-0 and beat a 2017 European champion and two Olympic champions on his way to making the 97kg finals. In the gold-medal bout, Alborov will wrestle U23 world champion and Asian runner-up, Mojtaba GOLEIJ (IRI). The finals are scheduled to take place on Saturday at 5:30 PM local time. 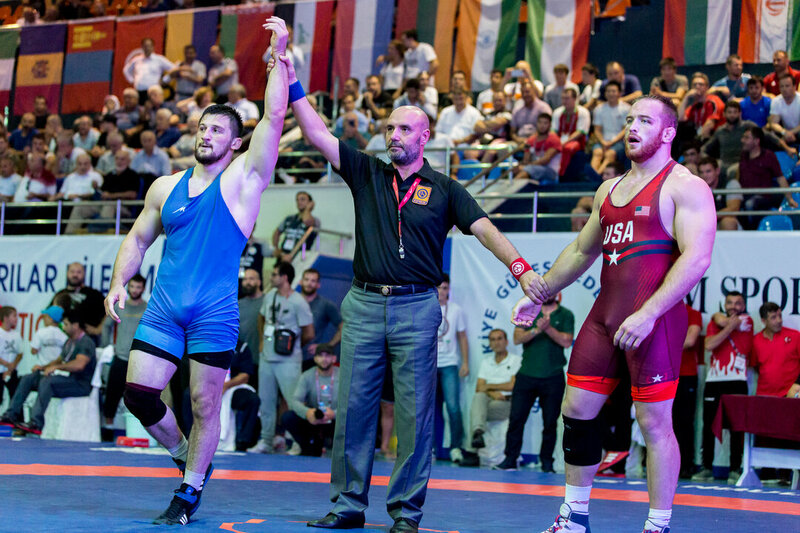 ISTANBUL, Turkey (July 29) - First-time world team representatives Kyle DAKE (USA) and David TAYLOR (USA) thumped the competition, picking up seven falls and a technical superiority victory on their way to winning gold medals at the 46th Annual Yasar Dogu. Kyle Dake closed out the Yasar Dogu in dominant fashion, picking up two falls and a technical superiority victory on his way to grabbing the 79kg gold medal. In his opening round match-up, Dake buried three-time world and Olympic bronze medalist, Cabrayil HASANOV (AZE) with a cradle after commanding an 11-2 lead to set up a semifinal match-up with Turkey’s Ayhan SUCU. It only took the Ivan Yarygin runner-up 60 seconds to score the fall over Sucu, locking for his second championship finals appearance of the year. Taylor pinned Kazakhstan’s Azamat DAULETBEKOV in the opening round after being up 14-6. In the quarterfinals, Taylor took on 2017 world runner-up Boris MAKOEV (SVK), who lost to Hassan YAZDANI (IRI) in the 86kg Paris World finals a year ago. Taylor sealed his spot in the semifinals after pummeling Makoev 11-0 before gathering his second fall of the day. In the semifinals, Taylor only needed four minutes to flatten Mediterranean Games champion Ahmet BILICI (TUR) after leading 13-4, making his second Ranking Series event final of the year. Four other American’s contributed to the United States’ team title run. Thomas GILMAN (USA), 2017 world runner-up claimed the 57kg gold medal, while world bronze medalist NICK GWIAZDOWSKI (USA) and the three-time world and Olympic champion Kyle SNYDER (USA) took home bronze medals. Jordan BURROUGHS (USA), the five-time world and Olympic champion was the sixth American medalist, finishing in second place after falling to two-time world champion Frank CHAMIZO (ITA) in an epic 10-10 shootout. With that loss, Burroughs now has more losses (two) at the Yasar Dogu than 11 World Cup’s and World Championships combined (one). GOLD - Bajrang BAJRANG (IND) df. Andriy KVYATKOVSKYY (UKR) via injury def. BRONZE - Hajy RAJABAU (BLR) df. Serdar BOKE (TUR), via injury def. GOLD - Taybe YUSEIN (BUL) df. Aisuluu TYNYBEKOVA (KGZ), via injury def.